The standard terminal appearance is just boring old black text on a white background. Apple included a few nice preset themes too, but to really make your terminals appearance stand out you’ll want to take the time to customize it yourself. While some of these tweaks are admittedly pure eye candy, others genuinely improve the command line experience and make using the terminal not only more attractive but easier to scan. Follow along and try them all, or just pick and choose which makes the most sense for you. Finally, we alias ls to include a few flags by default. -G colorizes output, -h makes sizes human readable, and -F throws a / after a directory, * after an executable, and a @ after a symlink, making it easier to quickly identify things in directory listings. 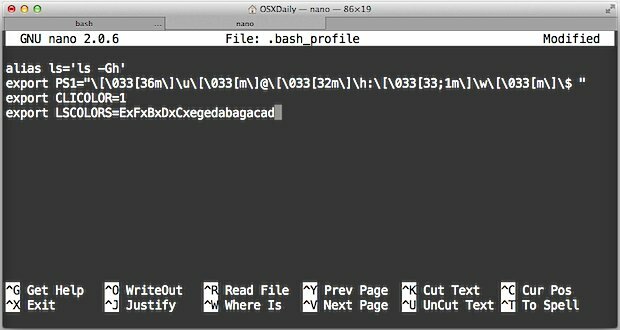 Open a new terminal window, run ls, and see the difference. Still not satisfied with the appearance, or have you already done that? There’s more to do. This will be theme and profile dependent, meaning you will have to adjust this for each theme. 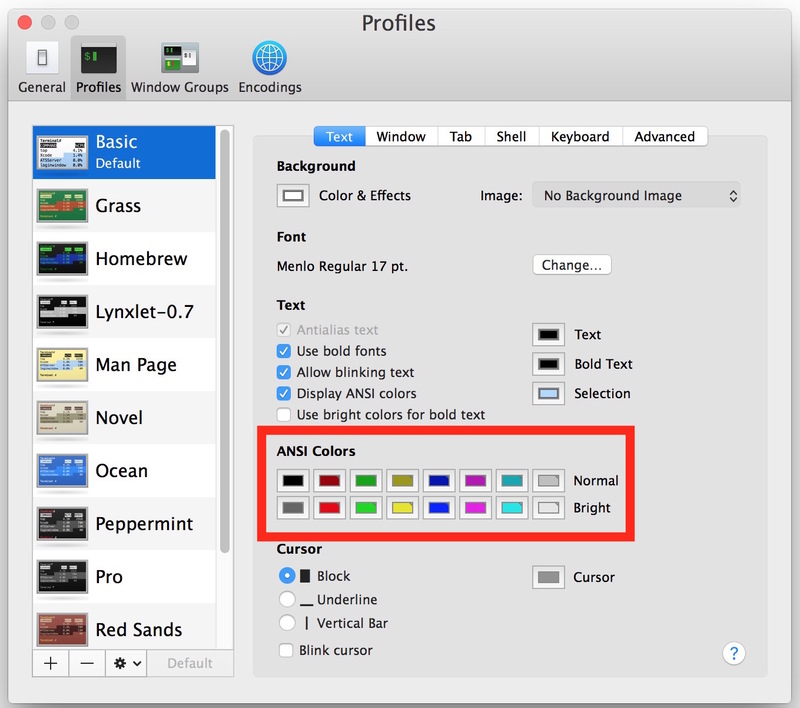 Most themes have ANSI color on by default, but enable it if it’s not. This makes things like directories and executables be bold and brighter, making them easier to spot in listings. Generally it’s best to adjust ANSI colors to be near their intended color mark but in the realm of being easier to read, a shade of grey to replace black for example. Opacity and blur alone tend to be enough, but going the extra step to set a background picture can look either really nice or completely garish. You make the call. You can also easily create your own by spending some time with Terminal Preferences and setting colors and fonts to what you like. Which is a bit more interesting to look at than this, right? Have a useful bash prompt or some other customization tip? Let us know in the comments. Text makes a big impact. I like Monaco as a font, anti-alias is a must, and use Command+ and Command- to change the font size on the fly depending on how much space you need. And don’t forget to use Full Screen Terminal if you really need to focus. Control-X does not work in Mountain Line Terminal. Also using the arrow keys did not work in the terminal window. I had this issue but tried a Return after the Control-X and that seemed to work. Thanks, it’s indeed better than the default one. 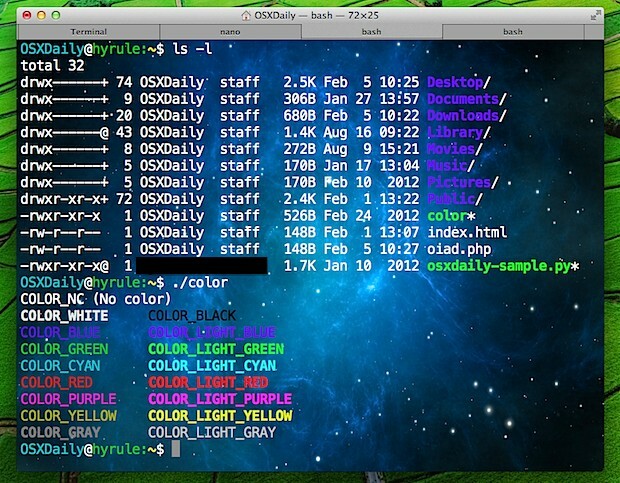 Colors is a must for terminal users. Thank you ! 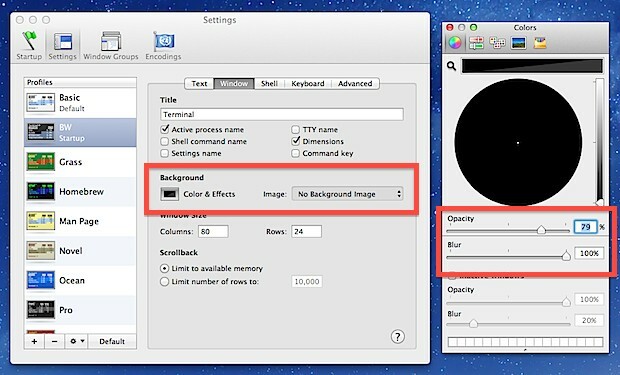 Control+X does not work in my Mountain Lion? Got any other suggestions. What do you mean ? Because it does work in nano. To change the colors in the PS1 prompt, change the text between the “\[033[” and the “m\]”. Nothing means reset to default; number means that color; number followed by “;1” means the bright or bold version of that color. For example, “\[33[34;1m\]” is bold/bright blue. The special values (e.g. \u for the username, \h for the hostname, \w for the current working directory) are documented in the “PROMPTING” section of the bash man page. Thanks Hoylen, this is what I was looking for — quite helpful knowing what this part means if you at all want to customize the command prompt more. 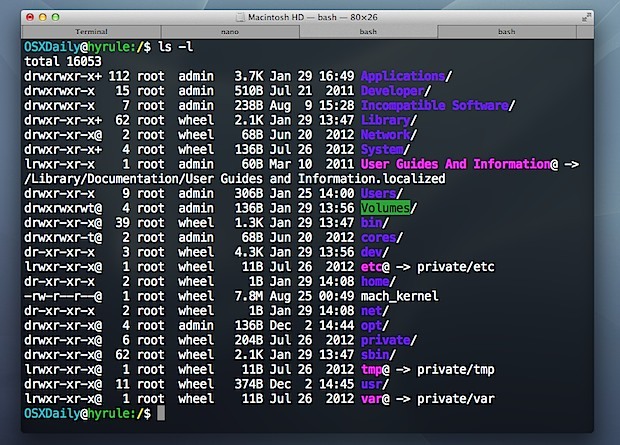 The best tip is get rid of Terminal.app and use iTerm2. Anyone who uses shell professionally will tell you the same. You may prefer iTerm2, but let others have their own opinion. 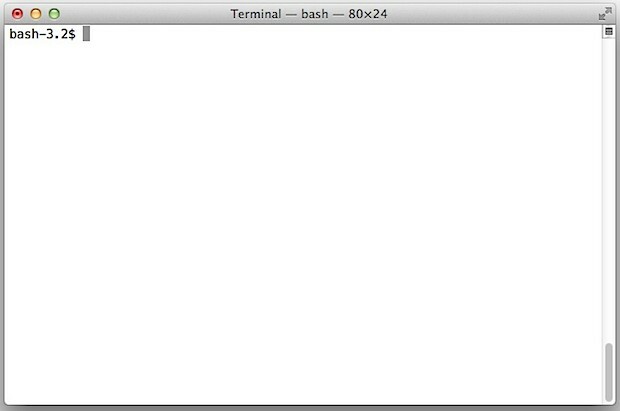 I also feel no need to try iTerm2 now that Terminal.app has tabs. iTerm2 is all right, but it does have some quirks that I personally find to be deal breakers. Apple’s own terminal does the trick for me. A little tweaking of the bash profile is the only really important part, as I also use the terminal built into IntellijIDEA/PHPStorm. Ever since I discovered the free Source Code Pro font, I’ve never used anything else for all my Terminal & plain text work. And the colors are pretty & convenient, but I prefer to go all green-on-black. Guess I’m just pining for my old Apple II+. LOLO, do you really think the first screenshot is an improvement ? Or is the improvement visible after wearing sunglasses ? You like monochrome? Cool. I like colors. 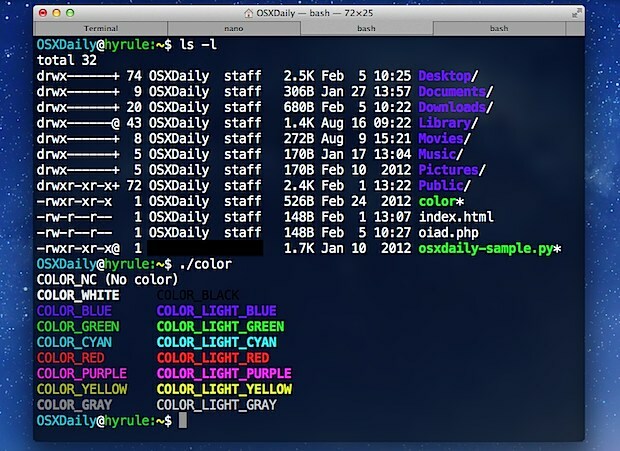 What exactly are the “command line colors” enabled by CLICOLOR? scroll down to “LSCOLORS” for more info. how to revert to the original ? Thanks for this article and useful comments! I put these into my ~/.profile – why would I use ~/.bash_profile instead? Any ideas how I can get rid of this? could chnage the terminal from humm to aahh. Thanks! got some colours going but nothing as shmcik as those above.. Thanks for this. Learn something new every day on my MacBook Pro. Too bad we couldn’t have these UI choices in Yosemite preferences. Can I affect the same changes in Ubuntu? Thank you very much. Worked like a charm. Great article! Can I change profile’s settings as text color and background of terminal by command line? How will I change the colour of my command lines? I want git init to be of different colour. Is that possible? How can I change “prompt” color with this solution? Currently it shows in black color. 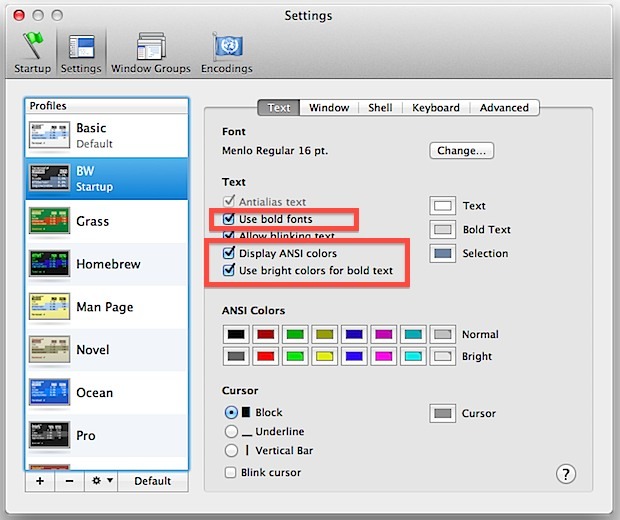 idan, you are looking to change the actual ANSI colors in use by Terminal application. I do this as well for certain color profiles because without doing so, certain things can be difficult to read with low contrast. In this case you are looking to change the black ANSI color for a specific profile to something with a bit more contrast, maybe a shade of grey will do or similar. Any ideas how I can fix it or where I can look to find the problem? Hi I changed the colors in my terminal but now I dont want colors anymore what should I do? what is the difference between .bash_profile and .profile? 1. Between “ctrl o” to save and “ctrl x” to exit nano, you MUST hit enter. 2. For your text color changes to still be the same when you open a new Terminal window, you MUST type: “source .bash_profile”. Using OS X High Sierra. but it gives an error as below. Thanks for the tip it works well. Brings the usefulness of linux terminals to macOS. Just one more thing if it’s possible – how do I get ‘ls’ to display directories first [then executables] then the rest of the files? –group-directories-first switch I could enable somehow? How do I change the color of the username only? I.e. I want to change “Kenjis-KBP:~kenji$” only so that it stands out against whatever commands I type following it. I’m using macOS High Sierra (v. 10.13.6) terminal. Excellent, this really does brighten up a dull terminal. Works well on macOS Mojave. Also Hoylen’s comment on explaining what the meaning of the value for the export PS1 part was quite helpful in letting me further customize the color of the command line prompt (and understand it). Two options for shortening/shortening more your command prompt. 1. You can replace the \w with \W to show present working directory (as in folder) instead of full directory (as in folder) path from user. In addition still using the change above, if you don’t want your hostname and username always showing in your command prompt, remove the username and hostname parts (including the @). For breakdown of what the full export PS1 value included in the article means, see Hoylen’s comment. Note: I don’t think these changes affect anything else besides color and content of prompt line, but I’m not an expert. that was awesome thanks ! As a web developer I often multitask between the terminal and GUI. Bc of this I like to add some opacity to the foreground terminal window (personal taste but find where you can see what’s behind it without losing the ability to read the text) and a lot of opacity in background terminal windows (just enough to see what that terminal was doing). That way I can (for example) read what’s on a web page while executing in the terminal.